The workplace has changed radically, and conventional approaches to desktop management and mobile device management (MDM) are no longer adequate for the new digital workplace. Enterprise IT must quickly and dramatically change the way it manages users’ access to digital resources to deliver a consistent experience across all devices, even as operating systems and platforms relentlessly evolve. Fortunately, with the advent of Windows 10, IT now can rethink the way it aligns endpoint management with users’ new digital work styles. 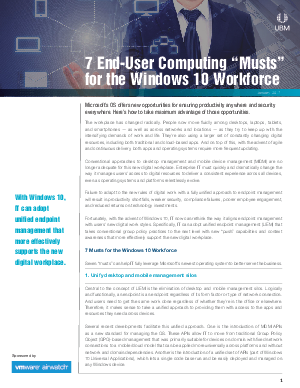 Read this UBM whitepaper to learn more about how these seven “musts” can help IT fully leverage Microsoft’s newest operating system to better serve the business.